Apricots bloom in February and early March, usually during a cold rain storm; thus, consistent crops are unlikely in North Coast counties. Apricots perform best in climates with dry spring weather. They are susceptible to late spring frosts. Bacterial canker is a common disease of young trees in California. Plant trees at about a 10 to 20 ft. spacing. 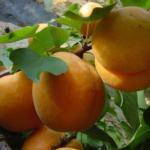 Apricots are mostly self-fruitful and ripen in late June to July (100–120 days from full bloom). Spray trees with dormant oil to control San Jose scale, aphid eggs, mite eggs, and peach twig borer. Do not use sulfur on apricots, ever. Spray to control brown rot and shot hole fungus as blooms start to open. Sprays may be required at 10–14 day intervals if weather is rainy. Drip irrigate daily or sprinkler irrigate every 2–3 weeks. Fertilize before 1st irrigation with 1–2 lb. of urea. Water in. Thin fruits to about 4–6" apart when 1/2–5/8" diameter. Paint trunks with 50/50 mix of white interior latex paint and water to prevent sunburn and borer infestation. Continue same irrigation schedule as in spring. Fertilize young trees monthly at ¼ spring rates to encourage vigorous growth. Prune trees before onset of winter rains to prevent Eutypa fungus infection of pruning wounds. Remove about 20% last year’s growth to let light into tree. Remove old, broken, diseased branches. Spray trees during or after leaf fall but before onset of winter rains to control shot hole fungus. Do not use sulfur on apricots, use fixed copper.